When and why did people start living in cities? The birth of settlements and cities is closely tied to the discovery of farming, known to historians as the Neolithic Revolution, arguably the most important innovation in human history. The ability to acquire food on a regular basis drastically changed life: there was more stability and order. Food production increased as people learned new ways of producing and storing more food. A surplus of food emerged. Surplus=having more than one needs, extra. Probably the most significant change that took place with the Neolithic revolution was a dramatic increase in population. More food could sustain more people living together. During the late 18th century, Europeans invented a series of agricultural innovations that led to industrial towns growing out of small villages or along canal and river routes. The development of better farming techniques and the enclousure of land meant that more and more people flooded to urban areas in search of work. Before we answer this question it is important that we understand the meaning of the terms "Site" and "Situation" and "Function"
Site = the site of a city is its absolute location, often chosen for the best trade location, best defensive location, or an important religious location. Situation = its relative location, its place in the region and world around it. Function =Centres of religion, commerce and education. Early cities were sited close to fresh water in river valleys to help irrigate their crops, e.g. the early cities of Mesopotamia. Over time the location of cities changed. Prior to European exploration, most cities were located in the interiors of cities. Overland trade routes such as the Silk Road sustained these places but as trade became more sea-based cities more and more began to locate near the coast. Around 1800, Western Europe was still overwhelmingly rural. As thousands migrated to the cities with industrialization, cities had to adapt to the mushrooming population, the proliferation of factories and supply facilities, the expansion of transport systems, and the construction of tenements for the growing labor force. As such the siting factors changed as towns and cities started to locate near to sources of power such as coal, and transport links such as canals and train lines. When you look at a map you see an array of places of different sizes, with varying distances between them. The map looks like a bit if a jumble, yet each place is where it is because of some decision, some perception of the site or its situation. In studying the size of cities and distances between them, urban geographers have explored the trade areas of different size cities. Every city and town has a trade area, an adjacent region within which its influence is dominant. For example, customers from smaller towns and villages come to the city to shop and conduct other business. The cities newspapers are read, and its television stations are watched in the surrounding region. What is Central Place Theory? REMEMBER that small settlements will only provide low-order services such as a post offices, doctors and newsagents. Large towns, cities and conurbations will provide low and high-order services such as leisure centres, chain stores and hospitals. Larger settlements and conurbations have a much larger sphere of influencethan smaller ones. This means they attract people from a wider area because of the facilities they offer. Cities such as London have a global sphere of influence, whereas a small hamlet or village may only have a sphere of influence of a couple of kilometres. The range of a service or product is the maximum distance people are prepared to travel to purchase it. The range of a newspaper is much lower than an item of furniture for example. Researchers have argued that neither model accurately reflected city structure in the mid-20thC. The multi-nuclei model and galactic model recognize that the CBD is losing its dominant position as the nucleus of cities. Most geographers agree that these models are too simplistic to describe the modern city. The availability of personal automobiles and construction of ring-roads and other arteries led to the explosion of suburbanization in the 1970’s and 1980’s. Suburban downtowns, often located near key freeway intersections developed many big regional shopping centers and attracted industrial and business parks, hotels, restaurants, entertainment facilities and even sports stadiums. 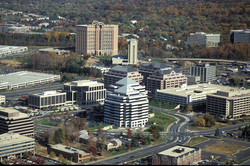 They became edge cities such as Tysons Corner, Virgina (see pic) which is outside Washington D.C. They attracted tens of thousands of nearby suburbanites – offering workplaces, shopping, leisure activities, thereby loosing remaining ties to the central city. Areas of disamenity are the very poorest parts of LDC cities that in extreme cases are not connected to regular services and are controlled by gangs and drug lords. The disamenitiy sectors in Latin American cities contain relatively unchanging slums known as barrios or favelas. In these communities there is little in the way of regular law enforcement, and drug lords are often in control or in constant battle with other drug lords. Watch the following video as many times as you need to help you complete the attached worksheet below. The following worksheets, notes and links will help you to review this unit for the exam.